I can't believe it has been one year! Well, actually more than one year. I'm a bit slow getting this posted. WordPress sent me a happy 1 year anniversary award on April 22nd. This is when I signed up for WordPress, but I didn't actually hit the publish button on my first real post until May 22nd. Truth be told, I started writing for the blog even sooner than that. Perhaps around January or February. It was part of my new years resolution. Why the long wait? I wasn't confident that I had any content to provide. I started brainstorming topics and actually started writing posts in Evernote to get myself ready. I also did a LOT of research. I wanted to know what I was getting into, which is funny, because I really didn't have any idea! I had no clue what a huge community the blogosphere is. I didn't realize that my most treasured followers/commenters would also be bloggers. I am really not sure what I thought blogging was going to be like. But whatever my preconceived notions were, I was wrong. blog from June 18, 2012 by clicking the image above. Look at how ugly those social buttons looked! Haha! Back then I just used a generic WordPress theme with little to no customization. I am so much happier with how my blog looks now! I mimicked my last design from WordPress.com on my new Blogspot.com site, mostly because I it was easiest to get the blog up and running. I am sure I'll do another blog makeover before another year passes. Here's to one year and counting! Anyways, lets get on to what everyone looks forward to with Blog Anniversary posts. The giveaway!!! I will be giving away these handcrafted Copper and Turquoise Earrings. The earwire and bead cage is made from copper German jewelry wire. These earrings are handmade by me! I just learned how to do scrolling, so check out those spirals on the top and bottom. OoooOOooo! The collage made the images a bit fuzzy, so check out more pictures via Google+. Total Prize Value = $30 (includes earrings and shipping). Giveaway is restricted to residents of the United States and the prize will be shipped via US Priority Mail. Raffle will end on June 21th at midnight. The winner will be announced the next day. The winner will be notified via the email provided in the Rafflecopter form. They will have 48 hours to respond; if they have not responded by this time, a second person will be chosen in their stead. I will send the prize via US Priority Mail. In order to win these earrings you must participate in the Rafflecopter below. Good luck on the drawing and thank you for reading my blog! Here's to another year! Oh best of luck over here Miss bethany.. I actually started out on Blogger about 3 years ago, had some wonderful followers (and you will too)then took a year off completely and well, you know where I am now. 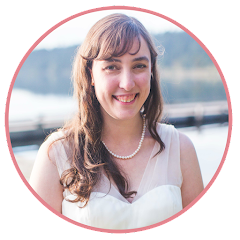 I'll definitely sign up for email and again Hooray for the new Blog! Lynne, Thank you so much! I am really excited about the move. I feel I will have so much more liberties with this platform. I didn't realize you were on blogger first. Congrats on the graduation and family stuff! We just picked up my stepson from the airport yesterday. Yay! got it--I'll do that now! CONGRATS on one year!! That's awesome! And what beautiful earrings! You are so talented! Wow, Bethany! Congrats on reaching your 1 year anniversary (and then some). I'm really impressed by the initiative you took to write several blog posts in advance months before clicking publish. That's some serious dedication...the sort of dedication that leads me to believe that you'll definitely be blogging 5 years in the future (if you want to be). Thanks for the sweeeeet giveaway! Would LOVE to rock those awesome earrings you made (turquoise is one of my favorite stones!). 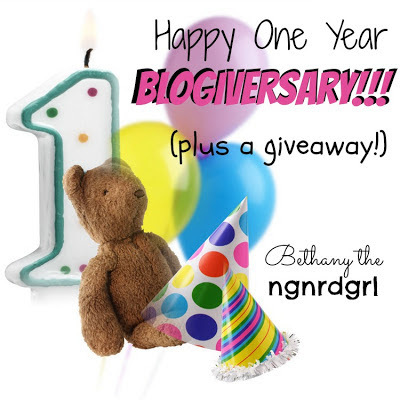 Congrats on your blogversary, Bethany! And now you know why I am drawn to the earrings in your giveaway!!! They are so pretty! Hope to win those lovelies!! Yay! Thank you! I really like how these earrings turned put. I'm going to end up making a second pair for me. That turquoise necklace is fabulous! I think I spied it in your about me picture! Congrats on your 1 year! My favorite piece of jewelry is a necklace with my son's name and birthstone. Thank you! Sounds like a perfect favorite jewelry piece. Congratulations! My favorite piece of jewelry is a pair of simple gold hoop earrings.